If I lived or worked closer to the Chinatown International District, I’d have trouble staying away from the Uwajimaya food court. Especially from Beard Papa’s bakery and its delicious cream puffs. The name of the pastry couldn’t be any better to describe the soft explosion of sweet taste that happens in your mouth when you bite into the confection. 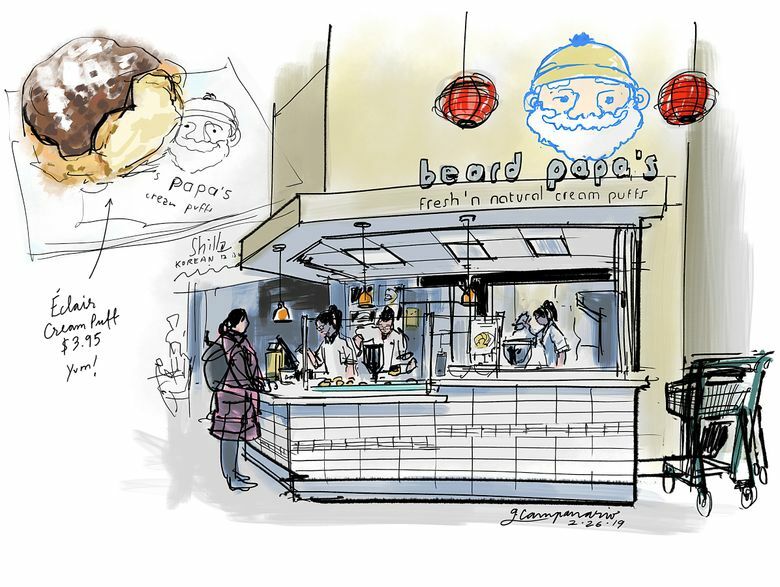 When the vanilla custard breaks free from its crunchy shell, you thank the baking gods and whoever opened this Beard Papa’s franchise — the international chain, founded in Osaka in 1999, only has one other location in the Seattle area, at H Mart in Lynnwood. Although I usually don’t sketch food — I rather eat it right away!— my éclair looked so good after my first bite, that I couldn’t resist making a drawing to tell you all about it.